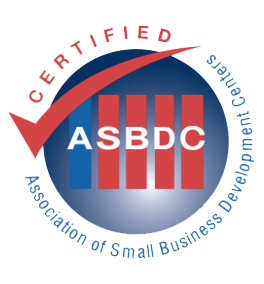 LivePlan is professional business planning software trusted by SBDC advisors. With LivePlan, you can advise your clients using a Lean Planning approach, always doing the right amount of planning for any business at any stage. Create a Lean Plan using LivePlan&apos;s one-page pitch, or collaborate on a lender-ready full business plan. Use the plan as a springboard and quickly understand your client&apos;s business. Reduce your time spent on forecasting by 70 percent. Walk clients through the process of building detailed strategic forecasts with instructions and examples at every step. Conduct regular advising meetings with your client, using LivePlan&apos;s Dashboard reports. LivePlan helps you be effective and engaged with your clients as they progress toward their growth goals. With a scalable, standardized approach to planning, you can create a repeatable process and streamline your advising. You&apos;ll be able to help more clients while improving your advising quality at the same time. LivePlan&apos;s simple collaboration tools let you give feedback to your clients, even when they&apos;re not in your office. You can see your clients&apos; progress and help keep them on track. 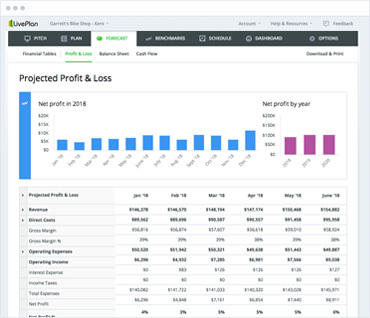 LivePlan turns your client&apos;s business plan into a real management tool. 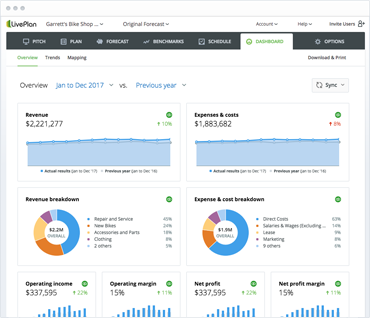 It&apos;ll automatically compare budgets and forecasts to QuickBooks or Xero accounting data so you can track progress in real time. You&apos;ll improve client retention by 30 percent and build long–lasting, healthy businesses. If you want to offer a business planning course either online or in–person, check out our "Start, Run & Grow Your Business" turn–key curriculum. It&apos;s included when you add LivePlan to your advising processes. Fill out the form below and we&apos;ll contact you shortly with information on partner pricing and how to start your evaluation. If you&apos;d like to speak to someone about LivePlan, call us at (888) 498–6136. Our customer service hours are Monday to Friday, 8am to 5pm Pacific Time. LivePlan is wonderful. The best part is how easy it is to make adjustments and quickly see how it impacts cash flow. For example, one client had a 1% DSCR (Debt Service Coverage Ratio) which was not good enough–I said she wants to aim for 1.2% so she changed her hourly rate and automatically all the financial projections updated. We could have spent hours recalculating in a spreadsheet. LivePlan&apos;s impact on our center was undeniable. Both our long term counseling and our online counseling doubled and capital infusion tripled. Additionally, LivePlan has provided a tool to reach out to lenders and show them the value of sending their clients to the SBDC, increasing the bank referrals. The utilization of LivePlan&apos;s software made it very easy to drill down to the core of the (business) plan in an impactful, one–page pitch. This was a great win for our center&apos;s clients. 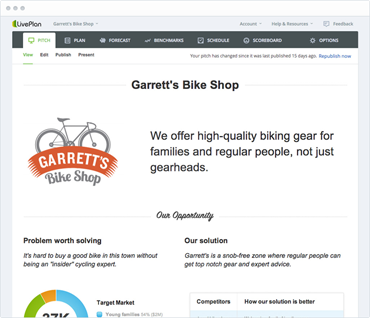 LivePlan can really help small businesses get to the next level. [It] is all about helping them realize that goal. Anyone can have a great idea, but getting that idea across to a lender or investor is crucial. Entrepreneurs will be able to put together quality plans that will, without a doubt, help their businesses succeed in the long run.